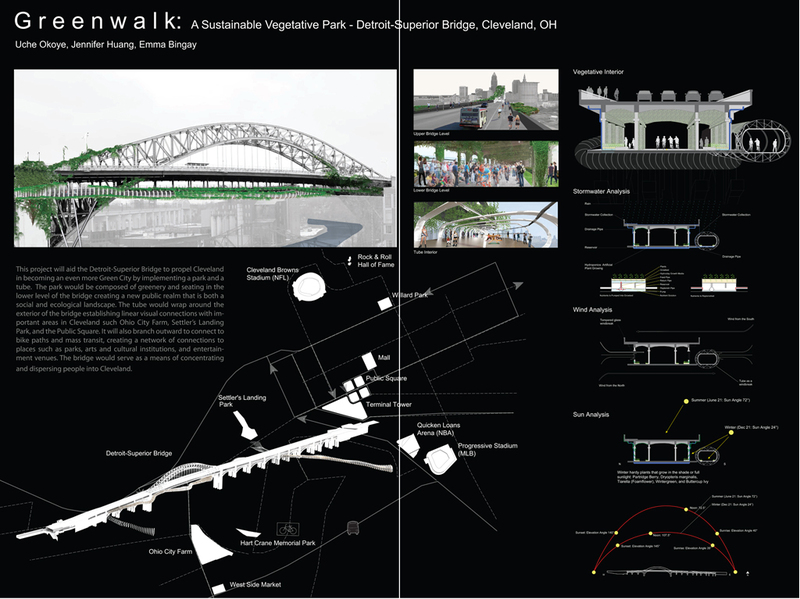 Overview: The bridge allows Cleveland to become an even more Green City by implementing a park and a tube. 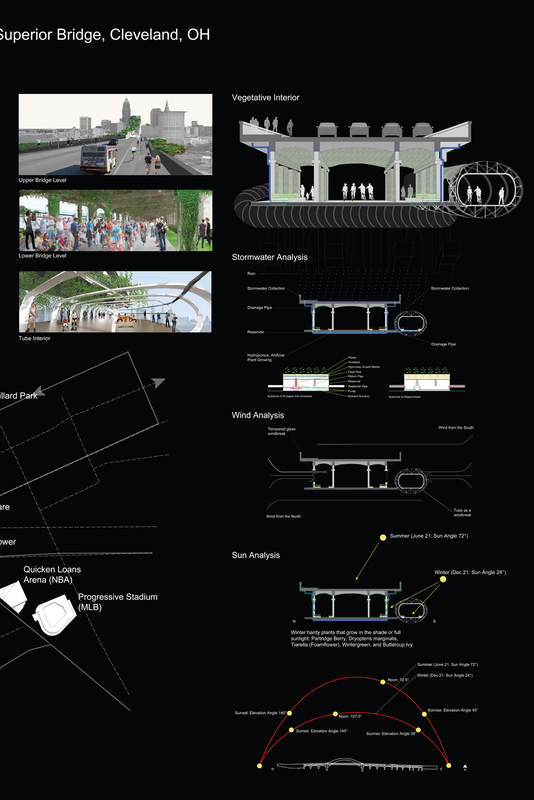 Implementing a park composed of greenery and seating in the lower level of the bridge creates a new public realm that is both a social and ecological landscape. The ceiling and columns would be obscured by additional greenery. Ten-feet bicyclist lanes would be placed in the middle area of the bridge with pedestrian lanes on the periphery. The park would transition from dense vegetation to lighter vegetation with more seating, from the west end to the east end. The tube would wrap around the exterior of the bridge establishing linear visual connections with important areas in Cleveland as well as branching outward to connect to bike paths and transit, creating a network of connections to places such as parks, arts and cultural institutions, and entertainment venues. 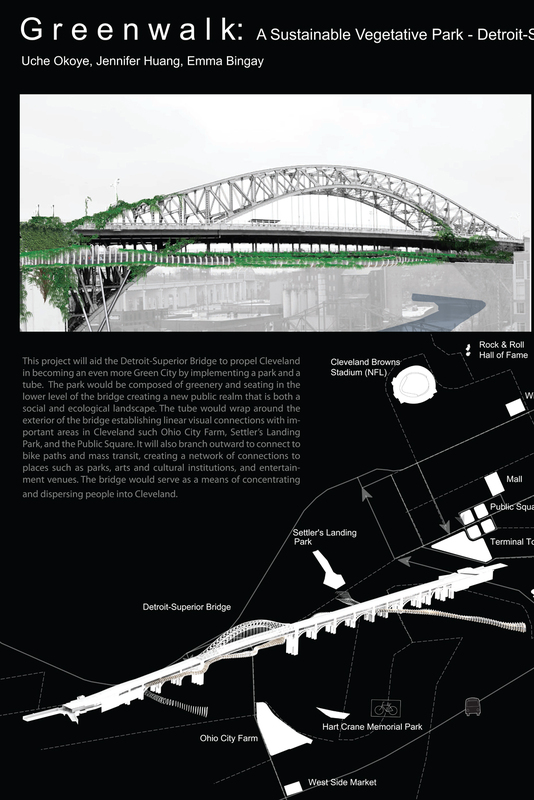 The bridge would serve as a means of concentrating and dispersing people into Cleveland. Within the tube the left side would have five-feet bicycle lanes and the right side pedestrian lanes. Where the tube widens, seating is placed.